Announcement 20% OFF & FREE SHIPPING* for a limited time on ALL* fine art print and canvas orders (*free shipping on domestic orders only). Use the codes FREESHIP2019 and BIGSPRINGSALE2019 at check out - offers can be combined! 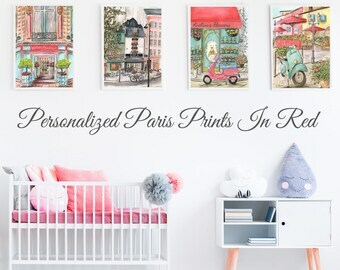 From Paris to Italy - to hot air balloons with baby safari animals - you'll find my fine art prints and canvases to be perfect for your child's nursery or bedroom. They also make the most cherished baby shower gifts! 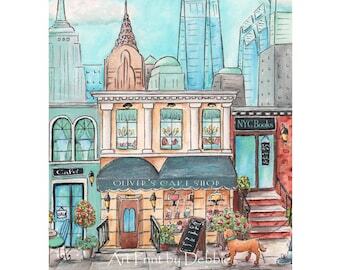 All prints are fine art reproductions of original watercolors, designed and painted by myself. 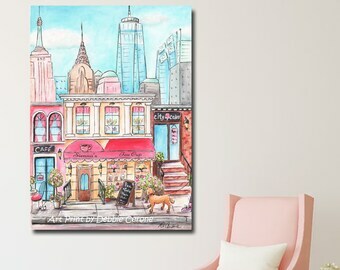 My prints and canvases are fine art archival quality and will closely match the images you see on the screen - however, please allow for some variation with computer screen colors. You can mix and match sets, get custom sizing and personalize as much as you want - for free! Just contact me with any questions or special requests. My (unframed) prints come in 6 sizes - from 5x7" to 24x36" (Poster Size). My prints are now available on 1 1/2" thick museum wrapped canvas - with pricing for a single canvas or sets of 2, 3, 4 and 6.
INTERNATIONAL CANVAS SHIPPING: Please contact me BEFORE placing order for canvases to be shipped outside of the USA. Shipping charges may need to be adjusted - depending on what country you live in (and the size of the canvases you are ordering.) In some cases, I will not be able to ship to your country. 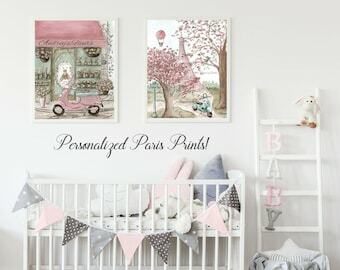 See what customers are saying about their Nursery Rembrandt Prints! 'Favorite' my shop so you'll be notified as new prints are listed. I am also on Etsy under WineWallArtByDebbie.etsy.com - where I sell personalized art prints and canvases for the wine lover. © Nursery Rembrandts, All designs are the sole property of Debbie Cerone and are protected under copyright. 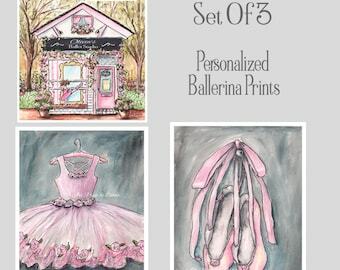 Purchasing a print or original does not transfer ownership of designs. 20% OFF & FREE SHIPPING* for a limited time on ALL* fine art print and canvas orders (*free shipping on domestic orders only). Use the codes FREESHIP2019 and BIGSPRINGSALE2019 at check out - offers can be combined! 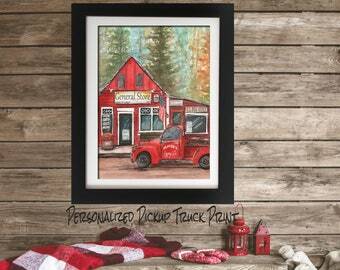 The Vintage Red Pickup artwork is beautiful and Debbie is absolutely wonderful to work with. She answers messages promptly and my item came in perfect condition and quite quickly. I definitely recommend this item and this seller. 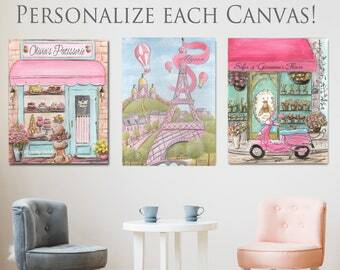 You can personalize 5 shops, with a girl's name (or different names on each shop) - making this the perfect set of prints for sisters or granddaughters sharing a bedroom! 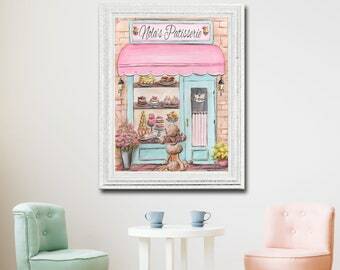 Add name to the patisserie, cafe, hotel, flower shop and boutique. 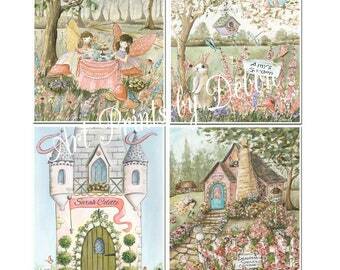 My fairy prints (or canvases) are now available in ‘Vintage Coral’. 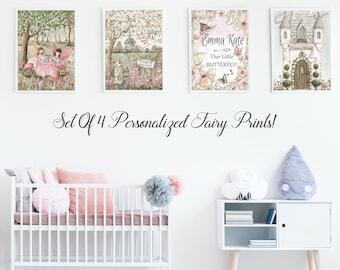 Each print can be personalized with a girl’s name so they’re perfect for your little girl’s ‘Fairy Themed’ nursery or bedroom! The set includes a fairy tea party & more. 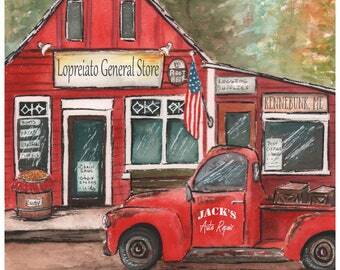 You can personalize the General Store, Post Office sign and Red Truck! This adorable print (or canvas) is perfect for the lumberjack or buffalo plaid nursery or boy’s bedroom. Creating a new print in by studio! Contact me if you'd like an original watercolor painting! PERSONALIZING is always FREE! 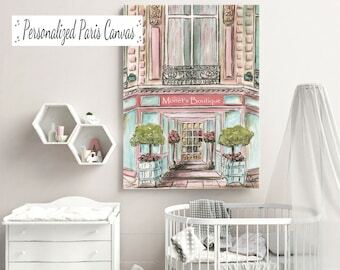 Personalized prints make great baby shower gifts and focal points in child's room! Discounts for multiple prints and sets. The more you buy, the less you pay per print! 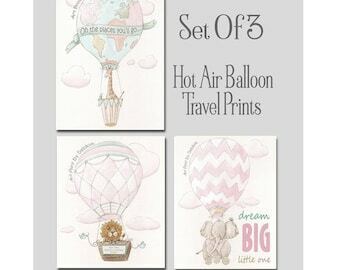 Set of 3 Safari Jungle Animals In Hot Air Balloons - On canvas! You can now get any print from my shop ON CANVAS. In love with watercolors and creating adorable art for children! Welcome to my shop! I have been painting murals in the Chicago area for the past 20 years and have been a featured artist in the Chicago Tribune, Chicago Luxury Home Tours and many model homes. 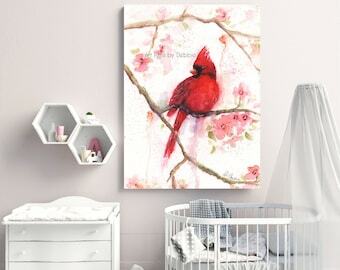 Because of my love of painting nursery and children's rooms murals - I decided to create original watercolors - that I could reproduce, print and ship to homes everywhere. 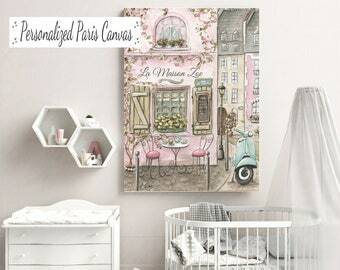 My wall art includes my popular Paris, London, Italy, baby animal and Travel Themed prints. Prints are 'Fine Art Giclée's' (archival, lasting over 100 years) - available in 6 sizes (to Poster Size). 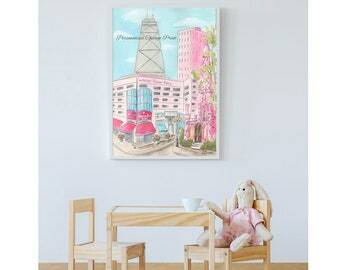 Personalized for free - they make the perfect baby shower gift or focal point in child's room! In fact, my prints are for kids of all ages! I've had bakery shop owners and women buy my prints for themselves. Because all archival prints are the same size and same price- you can MIX & MATCH any (same size) prints. If you want to 'switch out' a print in a set that you are buying (for another print), just let me know when you are checking out. All prints are available at a discount, when more than one is purchased. *** NEW! I have now added a listing for those who love my prints but do not need fine art archival prints. ***You can now buy my 8x10 prints (professionally printed on 100# card stock) for $9.99 each - with bigger discounts for set of 2, 3, 4, 5 and 6. Just go to my Shop Section called 'Special Offers'. Order any prints in my shop and mix and match (8x10's) as much as you want. No charge for personalization! All fine art prints are printed on a special, heavyweight 205 g/m HP paper. The paper has a slight luster and the colors are almost an exact match to the original watercolor painting. The paper and HP inks are archival quality, with 100+ years life. Even more importantly, this eco-friendly process assures that every archival print is also good for the environment! SHIPPING: For shipping in the USA, I ship all prints within 3-5 business days but usually ship much faster. As soon as your order is shipped, I'll send you expected delivery day and tracking number. Prints 5x7 and 8x10 and notecards will come in a cello sleeve (with stiff boards) in a rigid mailer. Larger prints will be gently rolled and shipped in an uncrushable art tube. After mailing over 200 orders, I have never had a package damaged in shipping! International Shipping: Please see my shipping info section. Need a print fast? Please don't hesitate to contact me if you need a print by a certain date. I'll let you know if it's possible and do everything I can to get you your order as fast as possible. 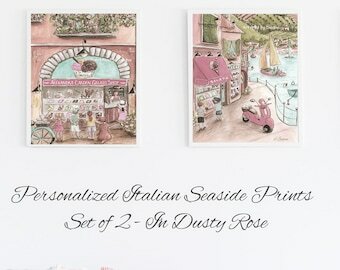 I am sure you will absolutely love my prints (see my customer reviews by clicking on link below this paragraph). All orders are guaranteed 100%. If you are not delighted with your prints - please contact me immediately. (Once the print is returned to me in it's original condition, I will refund your money in full). 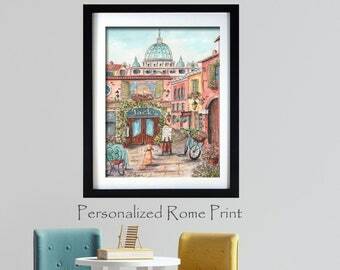 I am also on Etsy under ArtPrintsByDebbie.etsy.com - Art Prints by Debbie, where I sell art prints for beautiful archival reproductions of my watercolor paintings for the home. More art coming soon so stay tuned! and Facebook by searching Debbie Cerone Artist. All designs are the sole property of Debbie Cerone and are protected under copyright. Purchasing a print or original does not transfer ownership of designs. I have been painting murals in the Chicago area for 20 years and am now creating, painting and reproducing my artwork. 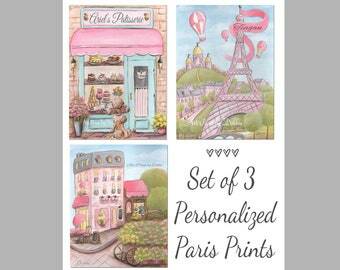 I love to design and paint fun, adorable, whimsical art for children - many of which can be personalized for free. I use a local commercial print shop to print my fine art giclees. Impact Color is a commercial printing facility providing exceptional quality large format quality photo printing. They print all of my fine art giclees and hand cut them. I have all of my canvases made by Printdropper. I do the original design and they transfer it to museum quality canvas and wrap around a 1.5" thick frame. They have the best quality that I have been able to find and a 100% guarantee. Is there a charge for personalizing a print and how do I let you know the name/s, etc. that I would like? Personalizing is always FREE! When you place your order, there is a place to put 'order notes'. This is where you tell me any specifics about personalizing. You can have different names on different prints, choose a font if you like, etc.. If you do not see the 'order notes' box, you can send me a 'conversation' separately. Also, if I don't see any order notes on a print (that can be personalized) - I will send you a message before I prepare order. So, please be sure that Etsy has a good contact email for you. One that you check frequently. Can I switch the prints that are in a set? Yes! You can totally customize any order. Just send me a conversation and let me know exactly which prints you want and I'll send you a link or create a new listing for you. Can I get a set of prints in different sizes? I need a couple of the prints to be larger. Yes! If you would like the prints in your set to be different sizes - just contact me - telling me exactly which prints you want and what size each should be. I'll set up a 'custom set' just for you - giving you the multiple-print discount. Can you change or remove elements in a print? The answer to this is generally no. Since all of my prints are reproductions of original paintings - I can't remove a hot air balloon or 'switch' a dog, etc.. However, please feel free to contact me if you have a special request. There are some things that I can do - including often being able to 'tweak' colors a little. 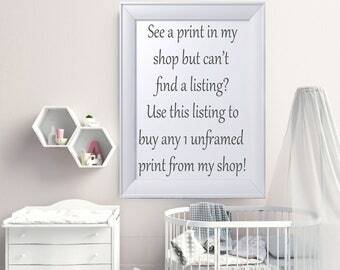 Are your prints framed? Can I get my print on canvas? My fine art prints are all UNFRAMED. 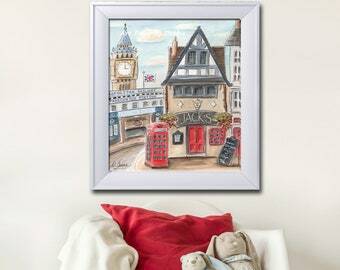 However, they come in standard 'off the shelf frame sizes' - so you won't have any expensive framing costs. All of my prints can be printed on museum wrapped canvas. I have a shop section dedicated to prints on canvas. If you have any problems figuring out how to order canvas prints or find the pricing, sizes, etc. - please don't hesitate to contact me. Do you sell digital copies of your prints? No, I never sell digital copies of my prints. This is the most frequently asked question that I get and the only exception to this - is if you have had custom art done that is specifically for you or your company. Can you do a custom painting? I can almost always do a custom painting. I have done several designs for companies (a gelato shop in Australia, a t-shirt logo for a flower shop, etc.) and I have done custom work for customer's for their nurseries or children's rooms. Please contact me for pricing, etc.. The pricing will be determined based on the intricacy and amount of details that you need. Pricing usually starts around $150 for custom piece (with not too much detail). This is a price for a 9x12" watercolor painting. You can also get prints of your custom painting (up to 24x36") but that is an additional price and would be priced that same as other prints in my shop. Is the coloring of the print going to be the same as it appears on my computer? In many cases it will be almost exactly the same but, since all monitors are different, it may be slightly different. My prints are fine art giclees, which means that they are almost exact reproductions of the original painting. But, of course, that doesn't take into account the difference in your computer's screen. What if my prints don't arrive on the expected date? If you live in the USA and your prints don't arrive within a day or two of their expected delivery date - please contact me! I will track your package, through USPS and, if necessary, request email and text updates. Unfortunately, International Shipments cannot be tracked. I ship around the world and have never (knock on wood!) had a package lost. However, there have been shipments that took a very long time (1-2 months). (These have been in Asia.) So, if you are ordering prints to be shipped internationally - please be aware that I cannot track them. I have found, in most cases, prints will arrive in Canada, Australia, Europe, etc. in app. 2 weeks. However, this is just an average. They may take a little longer. If I buy more than 1 print, can I get a discount? Yes! Any time you buy more than one print - you are eligible for a discount. 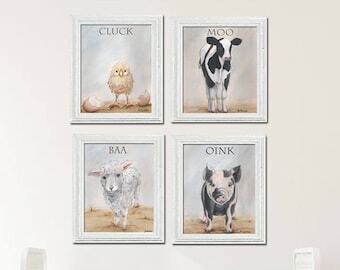 I have a shop section called 'Buy 2+ Nursery Prints'. This section features generic listings for any combination from 2 to 6 prints. Please contact me if you need any help ordering or finding the listing for the number of prints that you want.